Playing the guitar with a professional, symphonic orchestra is truly one of the most exhilarating musical experiences I’ve ever had. The sonic and timbral output from an orchestra is huge – much more so than a jazz big band (or most heavy metal bands, too ) and when you are a part of it, it’s like being intoxicated in a joyous musical brew of awesomeness! Here are the things that have helped me succeed when playing engagements with professional orchestras. Most orchestra personnel managers or librarians will arrange to have you pick up or send you the music one to two weeks ahead of the first rehearsal. After receiving the music, the first thing that I do is look for the guitar features and play through them, working out fingerings, page turns, etc. Then, I look for anything else tricky in the music like time signature changes, fast, cut time sections, challenging tutti parts, etc. After I have the musical requirements clearly in my mind, I look at the instrumentation so I know what guitars and gear to bring to the engagement. (electric, acoustic, nylon string, etc.). Get to the first rehearsal super early because there could be a lot of unknown challenges waiting for you when you arrive. 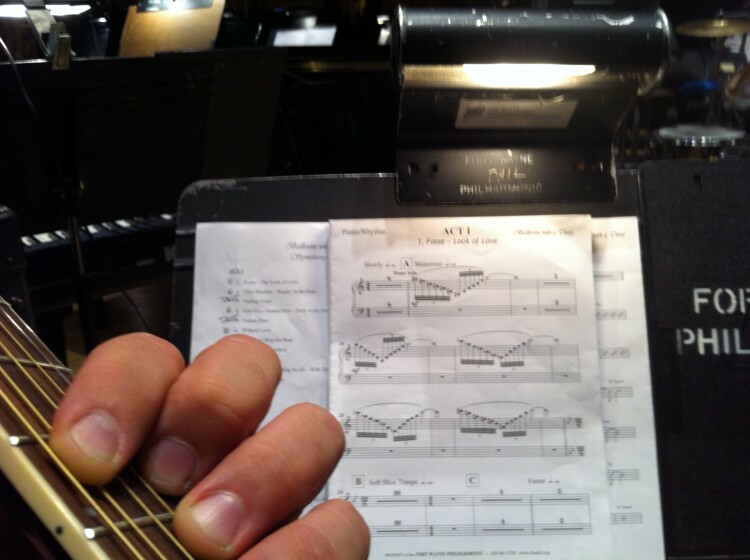 Because most orchestras do not have guitarists playing on a regular basis, the spacial and technical requirements needed by guitarists is easily forgotten by the orchestra sound technicians so be prepared to work with what you are (or aren’t given). Bring your own preamps and direct boxes, if you are playing acoustic guitar and also bring a high quality amp that you can plug into as a personal monitor. (I use a Roland JC-77). if you are doing any electric guitar work bring a small but powerful guitar amp, preferably with a line out. I like to use a Twin Reverb with a small pedal board when I am being mic’d from the amp and a Fender Princeton Recording Amp when going direct. Also make sure that you have a clean power source or at least bring a power conditioner and RF choke with you, just in case. You’ll most likely be scribing notes onto your charts during the rehearsals so have a few sharp pencils and an eraser handy. The changes could be fixes to errors that made it into your part or the composer or conductor may call some audibles at the rehearsal. Remember that you are the “new guy/gal” and making a good first impression with everybody in the organization is essential to your continued participation with that orchestra. For example, if the rehearsal schedule contains any dress rehearsals, come dressed in your prescribed performance attire. One of the orchestras that I work with lists dress rehearsals on the schedule but the musician attire is casual for all rehearsals. At the first rehearsal I was decked out in a tux while everyone else was dressed in shorts and t shirts. A few of the musicians later told me that they appreciated the fact that I cared enough not to take any chances and over dress for the rehearsal. Make sure that you can see the conductor and make sure that the conductor can see you. Unlike playing with a click track in the studio or a metronome, playing under the direction of a conductor can mean subtle tempo fluctuations during the performance of a piece so keep your head up and your eyes on the conductor so you can catch any tempo fluctuations. You will be expanding your musician network with every personal contact that you make in the orchestra so be prepared to accept and give out several business cards. Nobody wants to play with a musician that’s overly serious and stoic so be joyful and have a great time at the rehearsals and performances. People like being around happy people so be happy. Make sure that you express your gratitude for being asked to play with that organization. Most of the time the orchestras’ hiring manager is a musician in the orchestra so be sure to tell him/her that you enjoyed the opportunity and would welcome future engagements. You are currently browsing the The Working Guitarist Blog blog archives for November, 2010.